Brooke Ditchfield onstage with Robin Athearn during Saturday's performance of White Rabbit Red Rabbit. 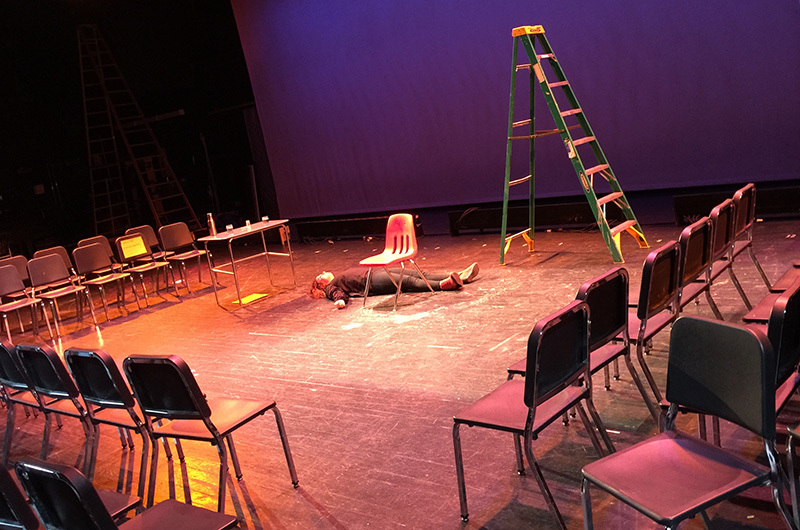 Vineyard audiences have two more chances to take part in a daring, international theatre experiment that changes with every performance. More than just a solo play, White Rabbit Red Rabbit unplugs the theatrical machinery we’ve heard humming along through generations of stage productions with predictable structures: lights up, lights down, applause at the right times, intermission on schedule, curtain call and ovation. This set requires just a handful of common household items. The lighting simply needs to make it visible. There’s no music and definitely no intermission. And before stepping on stage, the performer has never seen the script and knows virtually nothing about the play. So don’t expect to ease back in your seat and let it all wash over you. This show requires attention, rewarding it at first with laughs and later with deeper, more complex emotions. White Rabbit Red Rabbit made its Martha’s Vineyard debut Saturday night at the regional high school Performing Arts Center, performed by Brooke Hardman Ditchfield for an audience of about 60 people seated onstage. Breaking the seal of a large envelope, Ms. Ditchfield pulled out a script and began to read the words of playwright Nassim Soleimanpour. “For me, this is not so much a play as an experiment,” wrote Mr. Soleimanpour of the 2010 work, his first in English. Unable to leave his native Iran because he refused military service and was denied a passport, the playwright devised a unique way of getting his words into the world. Sometimes addressing the actor, other times the audience, Mr. Soleimanpour makes it clear that “we are all present,” himself included, inside White Rabbit Red Rabbit. “I don’t know the name or the gender of the person who is saying these lines for me... You are my future, and my ignorance about you provokes me to think and to write,” Mr. Soleimanpour’s play continues. It also frees the playwright to be a dictator, giving his actor some awkward moments as she interacts with audience members. Invisibly yet clearly in control, Mr. Soleimanpour leads his actor—and she leads the audience—into strange and challenging territory in which animals go to the theatre in a world that seems to be run by totalitarian Dadaists. There is an answer, though not what anyone would expect. It’s all part of the constantly tilting landscape of Mr. Soleimanpour’s play. “The power shifts in that play from the audience to the actor to the playwright and back and forth,” said Scott Barrow, a local actor and director who is presenting White Rabbit Red Rabbit twice more on the Vineyard this month. The next day, on Sunday afternoon, Ms. Ditchfield was still pondering her experience performing the show sight unseen. “That primal instinct of fight-or-flight did kick in a couple times,” she said. 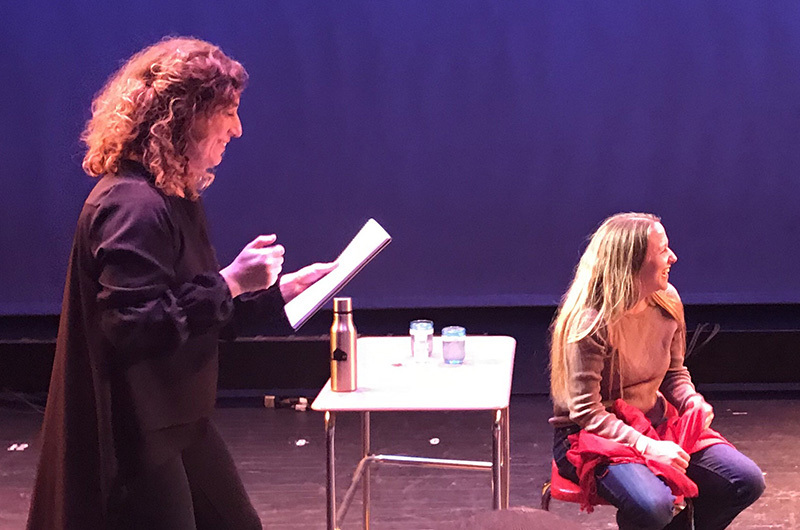 “Luckily I was in front of a very supportive audience.” This included three of her high school drama students who assisted Mr. Barrow with the production: Josephine Orr, Megan Delphous and Dougie Norton. “I’m still trying to formulate in words what it felt like,” Ms. Ditchfield continued. “I was very aware, pretty early on, of the weight of the responsibility to be asked to speak someone’s truth who could not speak their own truth for themselves,” she said. “I felt this great response to Nassim... because he was so blunt about his situation,” she went on. Two more actors will unseal the envelope containing Mr. Soleimanpour’s play before its Island run ends later this month. The Martha’s Vineyard Film Festival is presenting the play on March 23 at Pathways in Chilmark, and the final performance is March 29 at the Martha’s Vineyard Playhouse in Vineyard Haven. Actors for those performances have not been announced. Both performances begin at 7 p.m. with a pay-as-you-can ticket price, Mr. Barrow said. Reserve seats at jasmynstages@gmail.com.